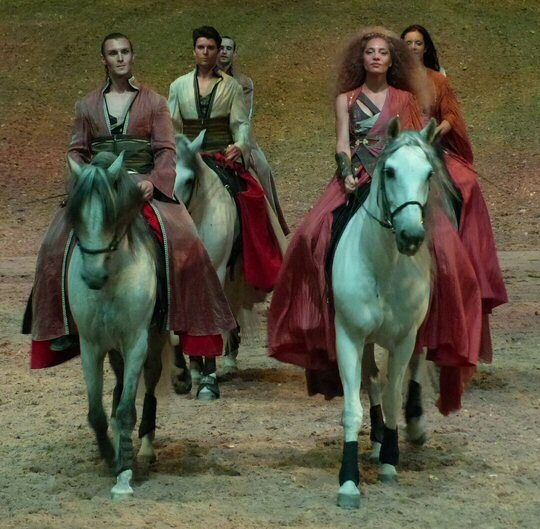 Odysseo by Cavalia triumphantly trots into Tennessee. Horse With No Name: Who can forget the crisp acoustic strumming and beautiful vocal harmonies on this track that was a radio favorite in the early 70’s by a true American favorite – America. What was really going on here though as one rider took an ill-advised journey through a post apocalyptic desert ultimately ending up under the sea all on an animal he never had the time to personalize? No need to worry about that at Odysseo by Cavalia – all of their 65 horses have names – all of them bold, dramatic and descriptive. Stop by the big tent to pay a visit to Fadista, Drago, Redino, Intrepido, Mikko, Dude, Zurick, Zatara, Greco, Utah and all the rest. Wild Horses: This Rolling Stones classic was recorded two hours south of Nashville at Muscle Shoals Sound Studio. It’s one of their more gentle and introspective songs and is always a fan favorite. We had the privilege of seeing the stars of Odysseo in their natural habitat when they arrived for their vacation in nearby Franklin. The 12 white Arabians were released from their handler’s care and enthusiastically took off to the far corner of the paddock to feed on the abundant blue grass. Still, these horses are no longer truly wild. They are the pampered and cherished stars of a traveling roadshow that has been thrilling audiences around the world non-stop since 2011. When you attend Odysseo by Cavalia you will learn that it takes 2 to 6 years for the stars of the show to master their individual disciplines. Horse Latitudes: Granted, this is one of the more disturbing songs about horses courtesy of The Doors. We’re not really sure what Jim was going on about. But, we can tell you there’s nothing disturbing about the two hour plus thirty minute intermission performance that is Odysseo by Cavalia. It’s all magical and wonderful. There’s horse latitudes, horse longitudes, parallels and adjacents. They jump up. They lay down. They’ve got it all covered under the big tent near Opryland. We recommend you check it out while you can! Emmy Love, Mikka and MCN’s Rich Lynch at the VIP Experience. Wildfire: This Michael Martin Murphey classic arose from the story told to him by his Grandfather describing a prominent Native American legend about a ghost horse. As the song is sung a sad tragedy is revealed inside of a dream. Gladly, there is nothing tragic about Odysseo by Cavalia but the whole show has a fantastic otherworldly dreamy quality to it in several acts featuring talented and acrobatic humans and horses. It’s wild no doubt! Save a Horse Ride A Cowboy: Before Odysseo by Cavalia overtook the Mid-Tenn region with their aggressive advertising and ubiquitous billboards Nashville was undergoing a transition as it adopted a new type of notoriety. That is, since late 2015, the town also known as “NashVegas” has become a haven of bachelorette parties overrun with brides to be who apparently come to Tennessee for one last blast of freedom by riding a pedal tavern. Once inebriated they sing and scream from the top of their lungs and one tune you are guaranteed to hear is this one by Big & Rich. At Odysseo by Cavalia they are all about saving horses and many of their stars are adopted once their tour of duty is complete. There are no cowboys but more mystical types of characters straight out of some type of medieval age fantasy in a parallel universe. You’ll just have to pony up for some tickets to see what we mean! Ventura Highway: We end the list the way we began it by citing a classic song by America. Why you say – this one isn’t about a horse. True. 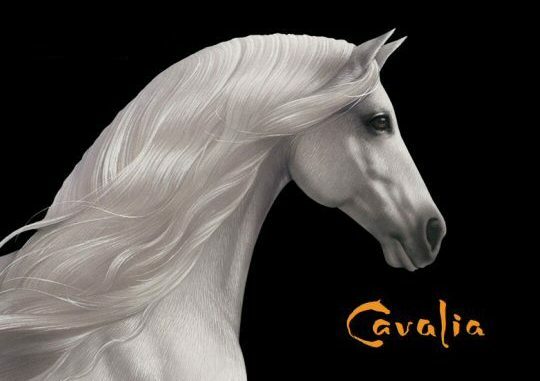 But it’s been confirmed that the Canadian founded production of Odysseo by Cavalia will be soon rolling into Ventura County, California as the next stop on their unceasing journey to continue building their legend one city at a time. Their 65 horses with names and 50 performing artists will begin thrilling audiences in the Golden State with “The Best Show Ever” starting in late November. A special tour of the backstage reveals the giant hill and techniques that make Odysseo happen. Odysseo by Cavalia is truly an immersive feast for the senses. After taking in opening night for MCN we returned two weeks later to try the VIP experience and it was well worth it. VIP experience attendees get a special pass and meet up at the rendezvous tent. There is a full buffet spread complete with chicken, beef, fish and pasta as well as drinks and adult beverages is served immediately prior to the show. During intermission you return for 30 minutes of dessert time while you contemplate the amazing production you have just witnessed. 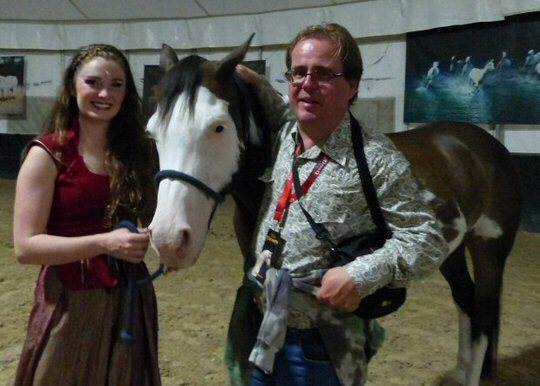 To top it all off the VIP experience allows fans backstage post performance to visit the horses and performers. With an announced extension now through October 8th there’s still time for you to take in the show with or without the VIP experience add on. 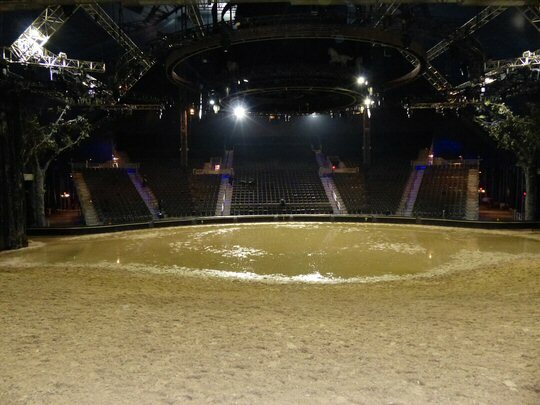 We have been so impressed with Cavalia and they have proven to be a world class organization. On Thursday, September 21, 2017 they invited a group of nearly two dozen children from the Tennessee School for the Blind to participate in a fun afternoon they will never forget. The children, who rely heavily on their other senses to fully understand the world, were guided by Odysseo artists through a sensory journey created specifically to meet their special needs. The group discovered Odysseo’s equestrian and acrobatic world through a variety of hands-on exercises. Members of the cast allowed the youth to touch the horse’s soft coats, brush and groom them. They smelled and touched the horses’ food; felt and tried the saddles; and listened to the horses’ heartbeat and breathing with stethoscopes. The young guests also played percussion with musicians and danced with acrobats. At the end of the tour, riders brought their horses to a full cantering speed, allowing the children to feel the ground quake beneath the incredible power of the equine stars. Much like Odysseo by Cavalia it was an amazing and moving adventure for all involved. Children from the Tennessee School for the Blind visit the big tent.